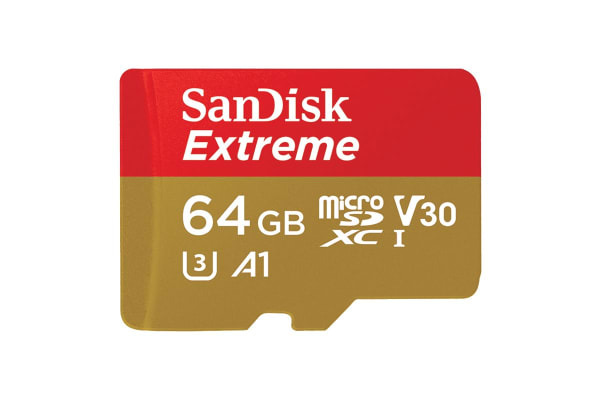 Ideal for your Android smartphone, action cameras or drones, the SanDisk 64GB Extreme microSDXC 160Mb/s Class 10 UHS-I SD Card does 4K UHD video recording, Full HD video and high-resolution photos. The SanDisk 64GB Extreme microSDXC 160Mb/s Class 10 UHS-I SD Card reads up to 160Mb/s and writes up to 60Mb/s. Plus, it’s A2-rated, so you can get fast application performance for an exceptional smartphone experience. Capture fast-action photos or shoot 4K UHD video with write speeds of up to 60Mb/s. The SanDisk Extreme microSDXC UHS-I card lets you shoot more and faster. With 64GB, the SanDisk Extreme microSD UHS-I card lets you capture 4K UHD and Full HD video with its UHS Speed Class 3 (U3) and Video Speed Class 30 (V30) ratings. Ideal for recording outdoor adventures, weekend trips or sporting events without skipping frames!